Interested in starting an intentional Christian community? I am. 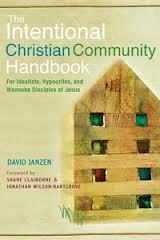 If you are too, you should probably consult The Intentional Christian Community Handbook: For Idealists, Hypocrites, and Wannabe Disciples of Jesus. Written by David Janzen, a long-time member of Reba Place, the book addresses both theoretical and practical issues of family, accountability, eating together, work schedules, decision-making, spiritual practices, and gender.